Three soccer players from Kalimpong have been chosen to represent the Indian team for the Second International Christian World Cup football Championship.The tournament will be held at Bogota Colombia (South America) from 10 to18 December. 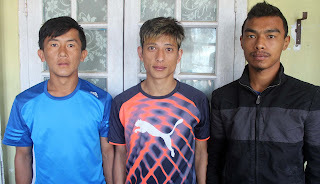 Mr Dewasish Rai from Algarah and Mr Issac Lepcha along with Mr Sonam Lepcha from Sangsay respectively have been selected for the soccer championship. All the three players are affiliated with Share Football Club. Agape Cup All India Christian Football Championships that was held at Salem, Tamil Nadu from 21- 23 October this year. Nehru Stadium in the state of Goa. The problem for these three players are that they have to make financial arrangements to purchase their tickets from Mumbai to Bogota and back. The departure date from Mumbai is 8 December.Again, the travelling expense to and fro Columbia will cost about 1.40 lakhs per head. for sports (Goa). In addition, the lodging,boarding and local transport will be borne by the organizer in Bogota. The associated church is carrying out fund raising drive for these players.“We are very happy that we will represent our country in the international platform,” said Mr Rai. 0 Respones to "Three Kalimpong boys to represent India in International football championship"